Specifications Zetor Forterra - ZETOR TRACTORS a.s. 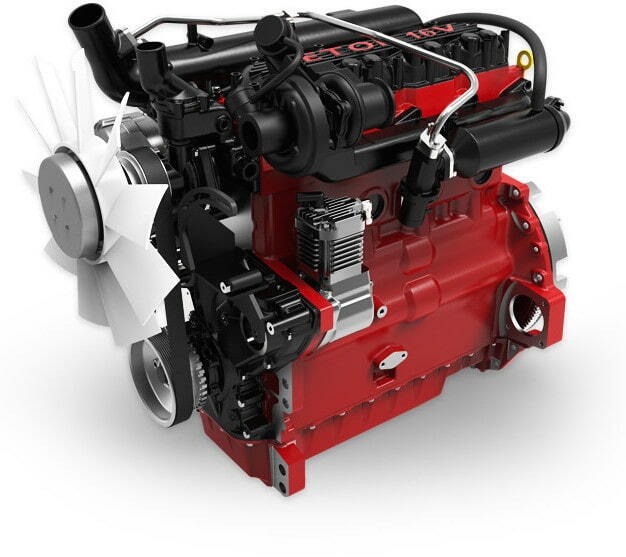 The economical ZETOR engines with 16-valve cylinder heads are the result of Zetor’s own development and manufacture. The engine construction is tailored to the requirements of a specific model, which is a guarantee of long service life, optimum performance and low fuel consumption. Forterra tractors equipped with the new engines meeting the Stage IV emission standard were tested by scientists from Mendel University. The study results confirmed that the fuel consumption of the new engines is lower on average by 19% compared to the previous engine generation. Combine this with a bigger fuel tank and it can now work an average 40 % longer between refueling. 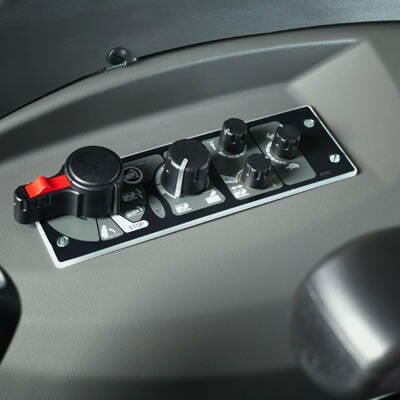 The use of the new Eco 40 gearbox additionally reduced fuel consumption. ZETOR uses in-house development and manufacturing facilities for the Forterra gearboxes. A higher number of usable speed gears keeps the engine at the optimum speed when working in the field, as well as during transport. This keeps the fuel consumption low. 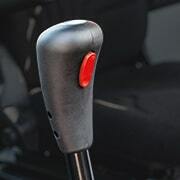 In the most frequently used working range of 4–12 km/h, you can rely on up to 13 gear speeds. 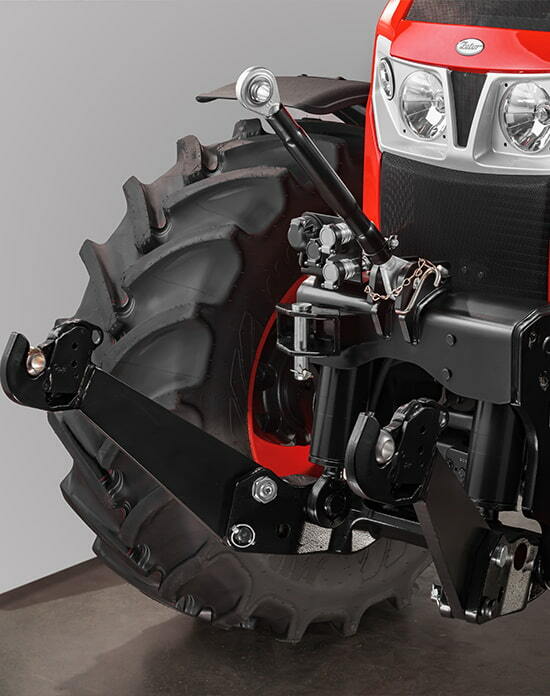 The more comfortable gear shifting and easier operation of Forterra tractors are also enabled by the function of the automatic torque multiplier which that ensures automatic gear shifting of the multiplier depending on the engine speed. Since 2018, the Forterra HSX and Forterra HD have been equipped with the innovated ECO40 gearbox. 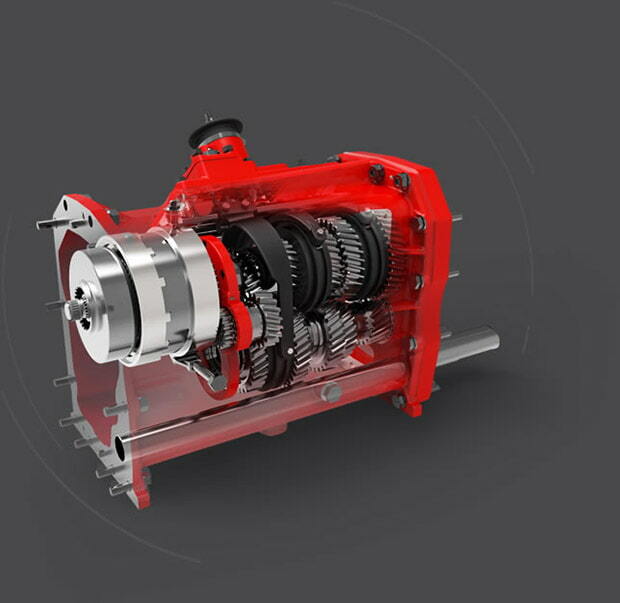 The new gearbox allows users to reach the maximum speed (40 km/h) at lower revolutions (1800 rpm). 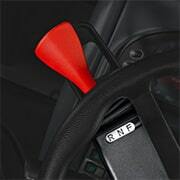 This optimization leads to fuel savings of up to 18%, and reduces the noise and wear of the engine. Standard ZETOR FORTERRA versions are equipped with electro-hydraulic three-point hitch control ensuring high efficiency when working with coupled implements. To make working in the field easier and of a higher quality, the Forterra HD machine is equipped with an automatic headland turning sequence system. Forterra HD is equipped with an additional four hydraulic quick couplers with electro-hydraulic control. The unique HitchTronic system received a number of professional awards after it was released on the market. 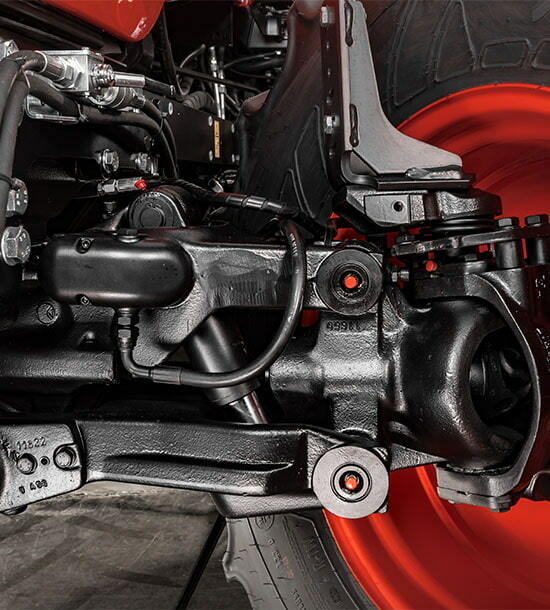 It is a unique system that automatically regulates the rear three-point hitch and does not require any settings for various types of regulation and their sensitivity. The system itself measures the soil resistance and regulates the three-point hitch adjustment according to the current values. The HitchTronic system thus increases the productivity of your work and, at the same time, reduces fuel consumption by 5-7%. The Forterra cab is comfortable on any ground. When working, you will appreciate the excellent ergonomic design. 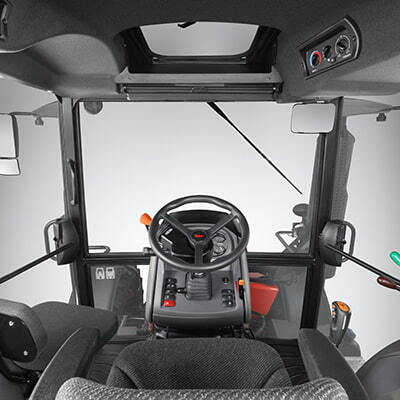 The cabs of Zetor tractors are spacious and driving comfort is improved by the dashboard with intuitive control of the machine. 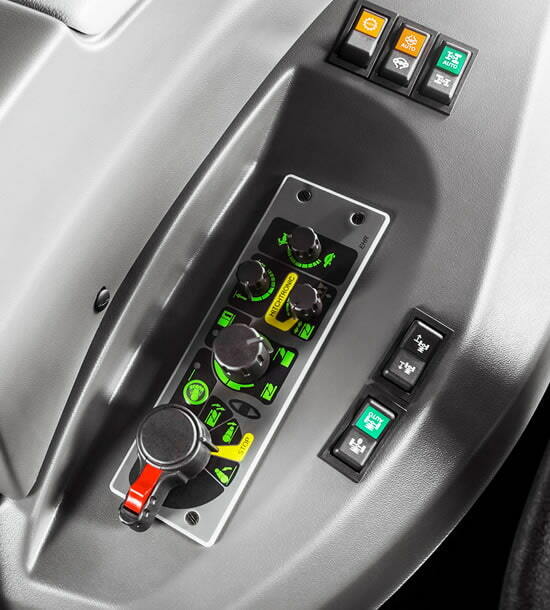 The Forterra HD is, in addition, equipped with a multifunctional panel on which all the important controls are combined. 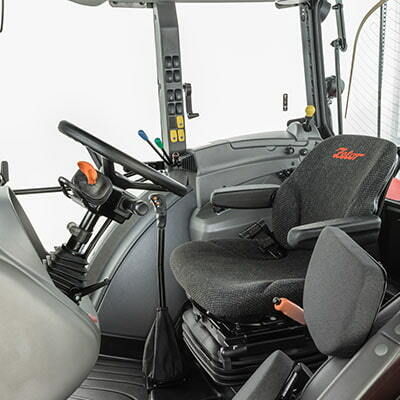 The driver has everything at hand, from hydraulic controls to the activation of the automatic headland turning sequence. The Forterra HD (standard) and Forterra HSX (optionally) are equipped with independent suspension of the front axle, which is structurally comprised of two separate and independently suspended half-axles. Thanks to smaller sprung masses, the axle has higher absorption and damping capacities and, therefore, a lower vibration level is achieved. 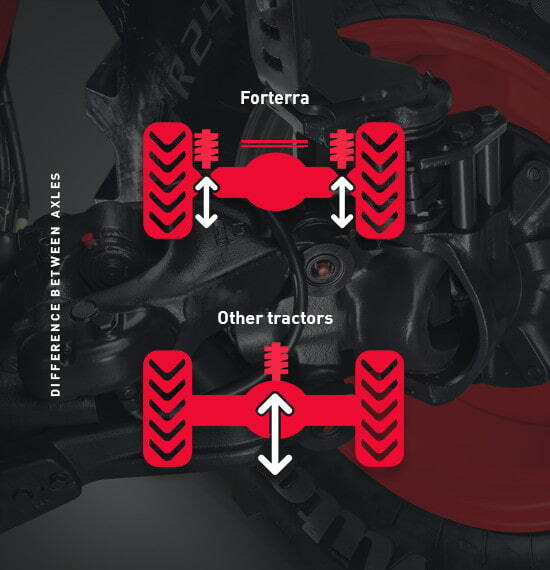 The mechanism of the independent wheel suspension is technically very similar to multilink car wheel suspension; therefore the drive in the Forterra HD and Forterra HSX tractors is as comfortable as in a car. 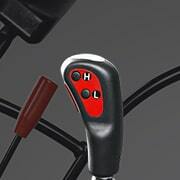 The highest Forterra HD model is equipped with a 100% differential lock and headland turning sequence recording. 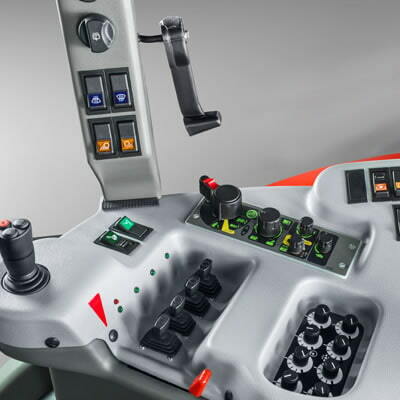 The automatic headland sequence system reduces the number of actions at each turning to make machine control easier and to provide better manoeuvrability. This system is based on a combination of the automatic control of the front driven wheel 4WD, differential locks and the rear power take-off.